This past week my parents were watching Glee reruns and the Gap episode was on when Blaine sings a song to this guy he likes for the holidays. It was interesting that the characters in Glee went to a location that they never film at. They always film at school or at the restaurant Bread Sticks. Gap is being advertised during this Glee episode "Silly Love Songs." Blaine wants to show this guy how much he cares about him and wants to be with him through a song. During the song at the store there was a sign that kept showing and it read "gfast," which is Gap's fitness gear. When the camera was rolling the audience can see all the jeans, glasses, clothing, and manikins throughout the whole song. Blaine walked around almost the whole store, so as an audience we can see everything that Gap sells. At 21:54 of the video above, that is when Blaine is in the Gap store watching the guy he likes. Blaine even says the brand name Gap right before he sings to the guy. Gap was really able to sell their store name so they would attract Glee fans to come to their stores. The store had great product placement because after Blaine sings he sits outside with Kurt waiting for the guy to leave work. 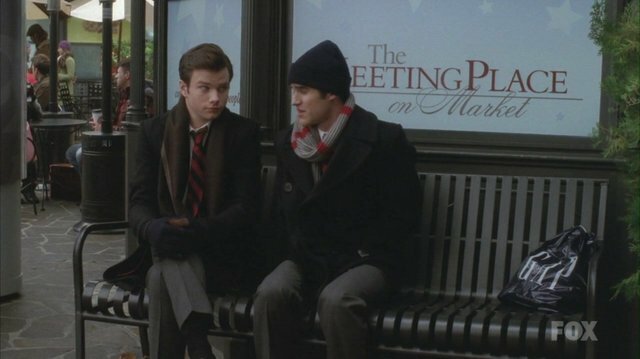 While the boys are sitting on the bench next to Blaine is the well know dark blue string Gap bag. At 25:02 when the guy finally comes out of the store you can see a Gap sign right behind him. No one can miss that gap sign at all the camera made sure that the audience can see the sign for a good 2 seconds. Having the Gap store in this Glee episode and having Blaine shop at the store showing the fans that famous people like the store. It also shows that Gap is not just a children's store it sells women and men clothing too.